The Osocozy prefolds that you love are now available in an ultra soft bamboo cotton blend. 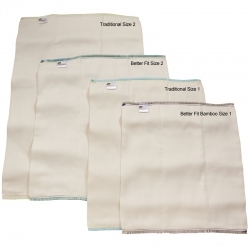 Made from 50% bamboo and 50% cotton, these prefolds are extremely absorbent and luxuriously soft. Bamboo itself is naturally anti-microbial which means that you are less likely to have ammonia build up when compared to synthetic fiber diapers. Sold in "Traditional" prefold sizes as well as "Better Fit" sizes. Tradional prefolds are sized to wrap around bay and be fastened with diaper pins or a diaper fasteners. Better Fit prefolds are sized to be tri-folded into a diaper cover. All sizes can work either way depending upon the size of your baby and personal preference. Prefolds are sold as singles. *These prefolds shrink about 9% in width and 13% in length. Just a little less than 100% cotton prefolds.